India successfully test-fired for a second time a nuclear-capable missile on Sunday that can reach Beijing and much of Europe, bringing a step closer production of a weapon designed to strengthen its nuclear deterrent. 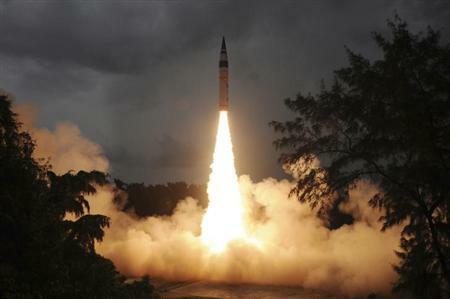 The Agni-V missile was first tested in April 2012. It is mostly domestically built and has a range of about 5,000 km (3,100 miles). Only the U.N. Security Council permanent members - China, France, Russia the United States and Britain - along with Israel, are believed to have such long-range weapons. Below are potential ranges of Agni type ballistic missiles fired from Wheeler Island which is near the eastern edge of India. Provided by a department of the Indian government, the intent of this illustration is to depict potential Indian WMD targeting of Beijing, while minimizing the threat to Europe. Unlike the United States, India (like China) has publicly renounced nuclear first strikes. Even so, Iranian defense planners have got to be vexed by nuclear weapon delivery advances within their geographical neighborhood. There exists open source citations of at least one example of COMINT where a high ranking IRGC officer has been voiced heated criticism of Iran's non-nuclear weapon policy, Fortunately Iran's military is under civilian control, with the SL branch of IRIG accorded commander-in-chief, and MODAFL overview and responsibility selected by the executive branch. Apparently this world is being ruled by arbitration. There's a certain string of rules that apply for a certain group of countries and then there is another rule for the "self-appointed Elite". The latter is dictating the terms for the former. It should be the reverse. In a perfect world, the group who does not possess nuclear weapons should force the group who does, to dis-assemble their respective arsenals and make them stop the development of such weapons. Governments all around the world need to come together at the UN and reach an ultimate decision on banning WMD's anywhere and everywhere, make sure the laws are set into motion, to get rid of those kind of weapons once and for all. How can the group of countries who does not possess nuclear weapons be expected not to develop any when the "Elite" insists on possessing such weaponry themselves? The "Elite" group must practice what they preach, lead by example.